We are happy to announce that our non profit organization, is now the proud owner of a coffee shop in Oklahoma City, OK! Higher Grounds Coffee Shoppe is located in the heart of OKC. They serve great coffee and some yummy house-made pastries. HG provides the community with a place to study, meet friends or have business meetings. They are active in their community but also plan to help support New Song Mission with the work being done in Haiti. We are excited about this partnership and hope if you are in the Oklahoma City area, you will stop by for a great cup of coffee! 1 the lending of small amounts of money at low interest to new businesses in the developing world. Having access to sustainable financial services enables the poor to increase incomes, build assets and reduce their vulnerability. Microfinance allows poor households to move from everyday survival to plan for the future, invest in better nutrition, improve living conditions and provide for their children’s heath and education. 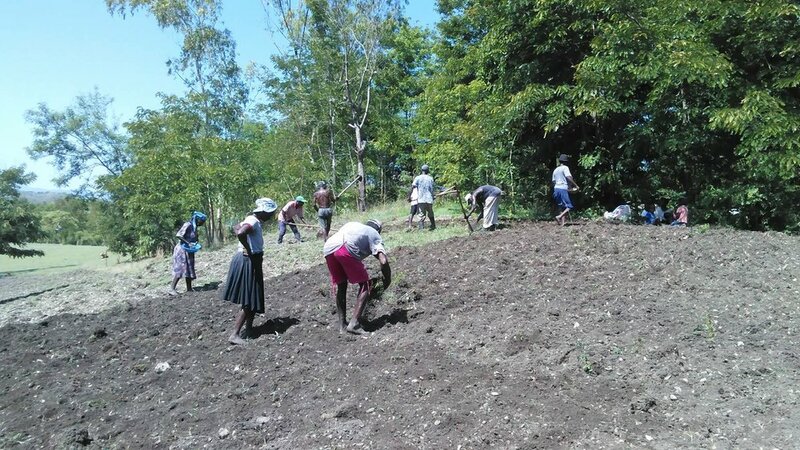 A few months ago, 10 Oklahomans understood the need to assist 10 Haitian families with a micro-loan. These micro-loans were given without an expectation of repayment, expectation of ever seeing the money or ever meeting those they loaned the money to. But the Haitian families have every intention of paying back the money, helping those in their community and increasing the health of their families. They have labored to prepare the land, plant the seeds, carry water to hydrate their crops that are almost ready to harvest. As they harvest, they will work together to process their peanuts and create life changing peanut butter that provides nourishment their children desperately need. They are working hard to change the future of their community and their families. As they sell the peanuts and/or peanut butter, they will use what they learned at their training meetings to save some of their profits, and pay back the loans that they were given. Then, 10 new members of New Song Church will have the same opportunity they were given; receive training and be provided with a micro-loan to start a small business. This small business will allow them to provide for their families as they may have never been able to. We are so grateful for the first 10 Oklahoman’s who took a leap of faith and gave without the possibility of return or ever seeing for themselves how their gift made a difference. God has not only grown peanuts, but grown these Haitians, and shown them how He provides for those who love Him. New Song has so many things to share with you about the ministry being done in Haiti. We have had growth in ministry, a broadening of how we share the Gospel, new believers being born again and programs that have changed a community. 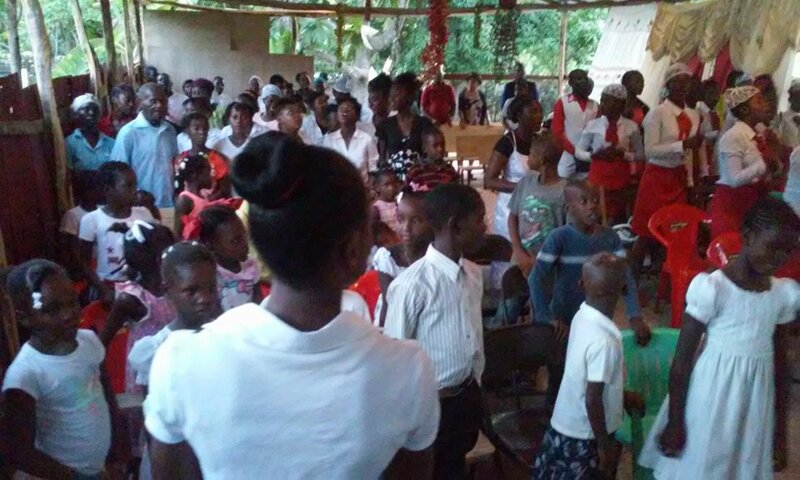 As you read through our latest newsletter you will see how God is being shared throughout the Central Plateau area of Haiti. This group was started by the man in the middle of the picture. When I first met him, we were at the hospital for his nephew, who was gravely ill. In his eyes and on his face I could see that he was a believer in voodoo. We could feel it in his presence. After seeing the peace his nephew had with dying, spending time at his bedside hearing the bible being read and seeing the love of Christ from Erick, his heart began to soften. At his nephew's funeral, he asked us to share more about who Jesus was. That evening, we were able to watch him accept Christ and this is where The Deliverance Group (they chose the name) began. He saw a need for food in his community, his church and in his family. He gathered several men, shared what little money they had to buy seeds and began to grow corn and beans. As they harvested, they sold some to buy more seeds and kept some to feed their families and those in the community. They worked in the gardens of church members that are ill or widowed. They spend many hours a week growing this group and their gardens. When asked, "How do other men join the group?" They answered, "We tell them, they can't join unless they accept Jesus and then we share the Gospel with them." There are many schools in the community surrounding NS church. There are also many parents that can not afford to send their children to school. Pastor Erick wanted to make a place where the children of NS church could attend school for a very small amount per year. That way the children are being educated and the parents aren't having to choose between feeding their family or educating their children. 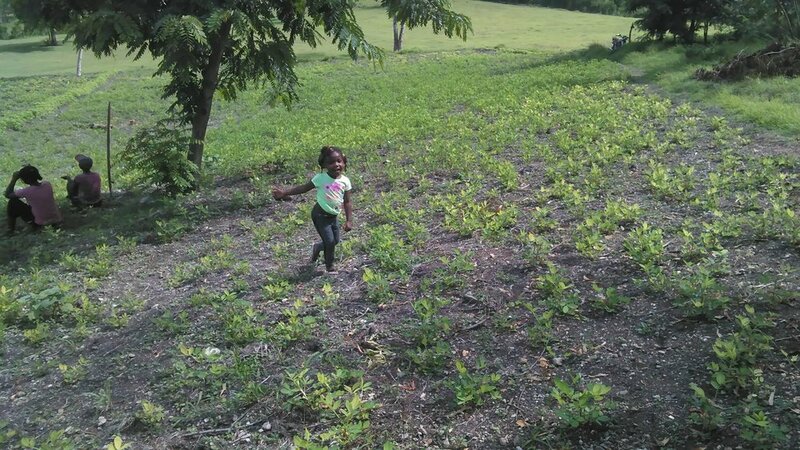 For $100 Haitian dollars per year, the children of the NS community can attend school. Currently approximately 85 children attend the school which is located in the New Song church building. The building is an open air building without walls, but these children don't seem to mind. There are 5 different classes being held in this one room building, which is the size of an American classroom that would hold about 23 students. You can hear the little voices singing a song about colors in creole. The older classes are learning French and another class is being taught algebra. These 5 teachers are dedicated and hard working. They keep the children's attention even though other classes are talking, clapping for each other or standing at the board leading the class in recitation. The teachers work for very little money 5 days a week. While meeting with the teachers, they shared that they love children and know that an education is so important for their future. Many of the teachers do not have a high school degree, but would like to continue their education if given the opportunity. We need your help to make the teachers and the school a success. Can you sponsor a teacher to further their education? Fund a teacher's salary? Sponsor a student to attend school? There are so many ways you can help New Song School! Cross Timbers Elementary students in Moore, Oklahoma filled over 200 backpacks with school supplies, balls, hygiene items and many other fun things! They each wrote a note to the students who would receive the bag and we delivered them to the students of New Song School. The children were so excited to see what they had received, they stopped on the hill, under a tree outside the school to peek in their bags! Thank you Cross Timbers for making a difference in the lives of these sweet faces all they way in Haiti! While we were in Haiti in November, we were able to take wedding dresses with us that had been donated by friends in Oklahoma. They willingly gave up a piece of one of the happiest days in their lives to bless some brides to be in Haiti. We were able to help 3 couples with dresses, rings, flowers and a small reception after. We were so excited to be able to share in this special day with the couples and New Song Church. New Song Mission wouldn't be successful in sharing the Gospel if it wasn't for you, your prayers and financial support. The ministry is growing and there are so many needs. After our trip in November, we came back overwhelmed by the burdens of the people in our community, the needs of the church and school. We have many ways that you can help! Please consider making a donation or supporting New Song on a monthly basis. Whether your donation is big or small...WE NEED YOU! Together we can make a difference in a country that is desperate for Jesus! Contact us at christyausley@gmail.com for ways to get involved. So many wonderful, amazing, and God inspired things have happened since the beginning of NewSong Mission and we want to say thank you to each and every one of you for your prayers and support. There are so many stories and examples of how individuals and families have been changed because of your faithful prayers and support. All the glory goes to God in each and every one of these things that have happened and continue to happen and we are excited that you are along for the journey with us. As you all know from previous emails, newsletters and from our website NewSong Mission is blessed to be a part of serving various communities throughout Haiti and we believe that in answering the call of the great commission each ministry and opportunity looks different in sharing the good news of Jesus Christ, baptizing believers and making disciples. This is the reason that we are excited to share with you the following announcement. NewSong Mission is multiplying! Effective January 1, 2018 we are now going to have NewSong North and NewSong Central. 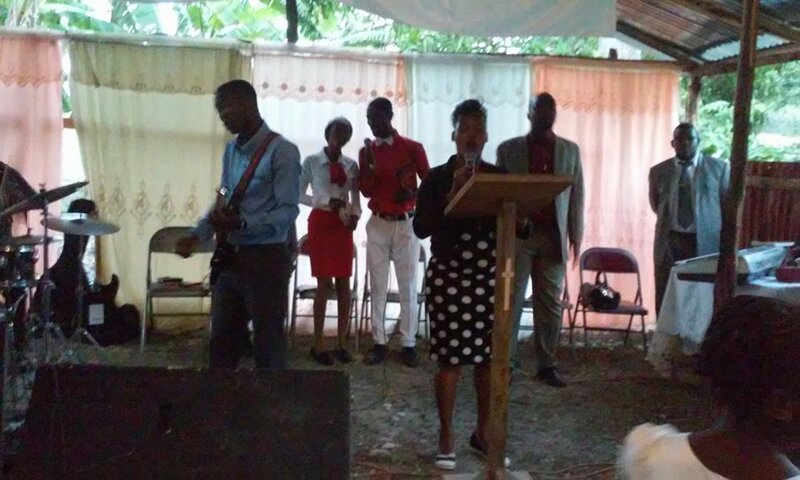 After a lot of prayer and direction seeking we believe so many great things are occurring in the geographical ministry areas we are serving both in Port-de-Paix and Mirebalais that a few changes had to be made to most effectively serve the areas God has placed us to serve. So, effective January 1, 2018 Gaston, Amber , Tanner and Sarah will be heading NewSong North and John, Christy, and Pastor Erick will be heading NewSong Central. We truly believe that by doing this it will allow both areas to be more effective in ministry and continue to do the work God has called us to do. The biggest thing we want you to know is that NewSong Mission is still one mission. This change will just allow both the North Mission and the Central Mission to place sole focus on the areas and communities in which each serves. We are all excited about the announcement and look forward to continuing to serve God and to serve others. With NewSong Mission now having its own 501(c)3, there will need to be a small change to the way funds are donated. For those who want to be a part of the ministry in the Mirebalais area and NewSong Church (NewSong Central) you will need to go to the NewSong Mission website (newsongmission.com) and setup your giving profile. For those who want to be a part of the ministry in the Port-de-Paix area (NewSong North), you will need to go to aimconnects.org then click missionaries/Caribbean and setup your giving profile. This will include any child sponsorship. Again, we want to stress to the NewSong Mission family that we are still united in the love of Christ and are grateful that God has blessed us with such growth that a need to birth arose. God is good all the time and we are anxious to see what God has instore for us in this new season. We will have another newsletter out shortly with some new stories and photos of ministry from both areas. To be able to visit your church members in their homes is very important to New Song Pastor, Erick Lero. He spends many hours a week meeting with church members, visiting the sick, checking on those that didn't make it to church on Sunday and praying with church members in their homes. But to see everyone that needed to be prayed with and checked on was hard for Erick as he had to walk great lengths every day. But now...he has been blessed with a new motorcycle and is able to see members daily, take them to the hospital, drive his daughter to school and spend less time walking and more time praying with his church members. We are so grateful to MissionOKC for their generous donation so that Erick could have a new motorcycle and helmet! THANK YOU MISSIONOKC! It was just one year ago that Amber and Christy traveled to Mirebalais to be with our friend Bernardo as he was approaching the end of his sweet life. After 10 days in the hospital, many tears and a lot of time spent with his father Bernard, we were able to watch Jesus welcome him home. But out of the death of this young man, the life of another began. Bernard, his father and his family accepted Jesus into their hearts. Without a bible or a way to read it, we left our friend, Erick Lero in charge of meeting with him weekly to read the bible, teach him what it meant and to disciple him into a relationship with Jesus. As a voodoo man, Bernard has a very minimal understanding of who Jesus is and how much he loves him. As they saw Bernardo's peace during his illness and our peace as we watched him pass into the arms of Jesus, they wanted to know how to have that peace. And Erick was going to share with them how to have it. Each week he spent time at their small piece of land on the side of a hill, reading, praying and discipling. At every meeting, more and more people began to show up to hear what Erick was teaching. They wanted to learn and be a part of this family of God that was growing. By the end of May, 300 people were meeting for a "church" service. They had prayer, worship, teaching and were quickly learning what it meant to care for each other as fellow believers. By August, they were calling themselves a church, they had moved to a larger space to accommodate the number of people that were coming every week and they began to serve others in their community. Now, its one year later, Addison and Christy were excited to join New Song Church for their one year anniversary celebration. After the week long revival, 9 BAPTISMS on Saturday, a large group gathered to celebrate the past year of growth in New Song Church. There were many groups performing beautiful worship songs and dancing and everyone was dressed in their celebration best. Worship was great and the message was preached out of Matthew. We were able to see friends we haven't seen in awhile, share a meal with the church and most importantly worship the amazing God we serve together. New Song church is serving in the community, teaching the word of God, making disciples and praying for the sick on a weekly basis. So many good things are going on in Mirebalais and we are so blessed we got to be a part of the celebration! The one year anniversary of New Song Church is this coming this Sunday and the week long revival began last night. There were many in attendance under the new, enlarged roof! There will be special performances by groups and individuals and Pastor Erick will be bringing great messages all week! On Thursday, Christy and her daughter Addison will be headed to Mirebalais to join them and they are excited to be a part of the one year celebration. Please be in prayer for those attending the revival this week and for the celebration on Sunday. Many of you have met our sweet friend Sylvannie. She is a spunky, older, widow from the area of Boudin. We met her almost two years ago while we were doing home visits. We were asked to come to her house to pray and found her sitting on a mat outside of her tiny metal and thatch "home". As we began to learn about her, we found out that she was not only blind, but the sole caregiver for her 10 year old grandson, Rovens. He was abandon by his father, her son and they had been given no support from him since he left. Our hearts broke for her situation. We had to do something, but we were unsure exactly how to help. Upon returning to the U.S, we wrote about her in our newsletter. After reading her story, a widow woman in Oklahoma City, felt compelled to help. She donated the money needed to build Sylvannie and Rovens a home! Not only did she donate the money to build a home, she also gathered a few other women to give monthly so that Sylvannie and Rovens could provide for themselves. Another family is now supporting Rovens so he can go to school. Needless to say, God has changed their lives. It has taken awhile to get the home finished. Many issues come up when building in Haiti. But we are happy to announce that Sylvannie and Rovens have a home! Amber and Gaston have reported that since moving in, Sylvannie is elated at her new home. She is not only mentally feeling better but they have seen improvement in her physical health as well. She knows that God has blessed her in so many ways. She knows that not only does her God love her but other women, some in her same situation, in the U.S. love her as well. She knows that God provides not only for your needs but for your deep desires as well. Sylvannie and Rovens are so grateful for the love of God and the friends of New Song Mission! As the one year anniversary of New Song Church approaches, the members are hard at work to make more room for the many that attend here every Sunday. They have increased the size of the seating area and in doing that, they needed to replace the roof to protect the members from the sun and rain. With a generous donation from Mission OKC (missionokc.org) they were able to complete the project quickly. The men of the church worked for days to complete the roof and some of the women cooked lunch so they could continue to work for hours a day. The members of New Song Church have been working together to complete this great project and we are so proud of how they are understanding what it is like to be a church!